The Family Table with Genevieve: Thusday Thoughts....Why do I Blog? I am a little over 6 months into this blogging world and thought I would share a little on why I decided to start blogging. I did a post when I first started on the story behind the blog and it's title. The past couple years, I have followed a few bloggers and I really enjoyed reading their daily updates. I loved following the stories of their lives, especially because they are just your everyday mamas working through life. These are a few of my favorites that kind of got me thinking of blogging. So I had a concept I wanted to do with my blog and that involved two of my favorite things, food and family. I wrote down some ideas about what to blog about and decided I would give it a go. I had surgery last fall, so while I was laid up I worked on the blog quite a bit and shared my first post in September. I had read up on blogging and found the most common advice was to be consistent. So when I started, my goal was to post on Monday, Wednesday and Friday. I stuck to that schedule the first few months. As my little blog grew, I found a very sweet blogging community. There are some more well known bloggers that offer a linkup. The linkups are a set topic to blog about and you can link up to their page to gain a larger audience. I am very grateful for these linkups, as they have not only provided me with a larger audience, but gave me a boost of confidence with my own little blog. As I started 2017 I wanted to post 5 times per week. I knew it would be a challenge, but with some planning it has gone pretty smoothly. 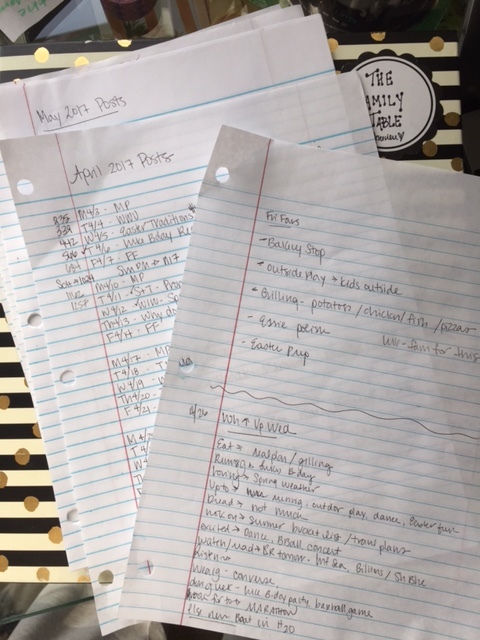 I have a schedule of each month and I plug in topics I may want to blog about, link ups, holidays, etc. so I have a guide of where to go. Nothing fancy, I am a good ol' pen and paper girl! The other benefit is I can write posts ahead of time when I am feeling creative. I didn't want this to be something I dread like "ugh I have to write a post". I try to blog in little pockets of my life... 30 minutes here or there, usually really early morning or later at night. Often on the weekend I may take 2 hours before the kids get up or when they are having some downtime and write a few posts to get me ahead. Turns out I have really grown to love writing this blog. I love that my kids will be able to look back and have a little journal of their lives in these years. I also hope that I am brightening someone's day with our stories, the same way I love reading others blogs! Here are a few fun stats about my blog! Not sure why this is the most read...but it is! Maybe because it was after the holidays and everyone was looking for a new way to save?? It was a fun post and I talked about two of my favorite things....meal prep & meal planning. Friday Favorites...Spring Where are You? Now I have been linking up to do Friday Favorites since November. For some reason, this one in March was my second most read post. I looked back through it and nothing stands out too much to me... just a random assortment of that week's favorite things. Well this one doesn't really surprise me too much, for two reasons. One, it is a link up with Mix & Match Mama and her BFF Erika at A Little Bit of Everything.....two very successful blogging mamas. And second... the topic.. little tips for marriage can make for an interesting read! 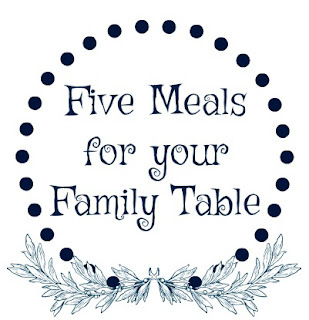 Five Meals for your Family Table. Every Monday I post 5 meal ideas for your family table. 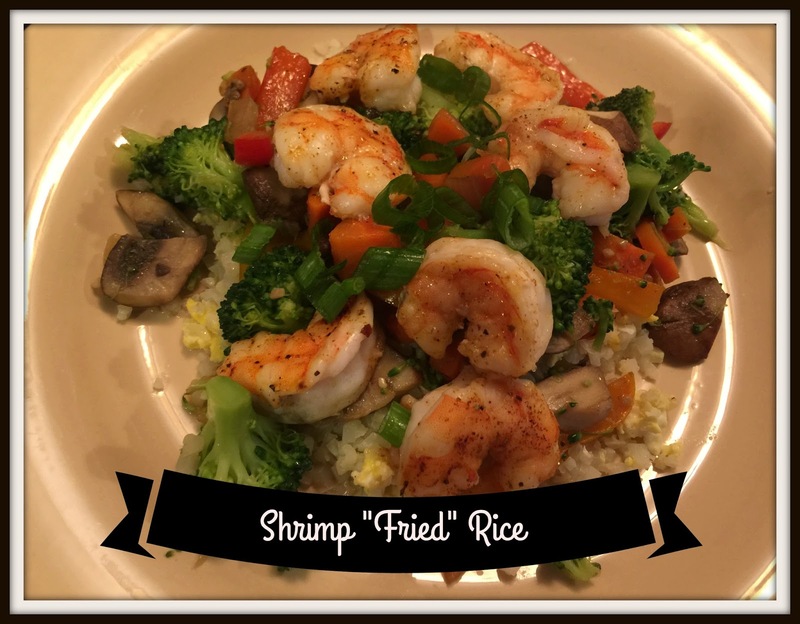 They are usually on the healthier side and I try to show a variety of foods and include a few prep tips too. Be sure to check in each Monday for new ideas! Here is what we have shared this year! This one totally makes sense...it is one of the most favorite meals in our house! So there you have it! An inside look to this little blog life! Thanks for stopping by to share this journey with us & please share with your friends! You can follow us on Instagram for the latest blog posts or click the link at the bottom of the home page to subscribe.